This is a dainty and demure ladies 1950’s solid 14k. white with diamonds that we purchased from the original owner. The 13x33mm. solid gold case has a full (authentic) diamond encrusted bezel and lugs. The solid 14k. white gold bracelet has hand carved flower motif with safety chain all in solid gold. The dial and hands are original. This watch simply “pops” on the wrist and is a piece of fine looking jewelry that will attract many eyes. The manual winding GRUEN movement was just cleaned and is accurately keeping time. 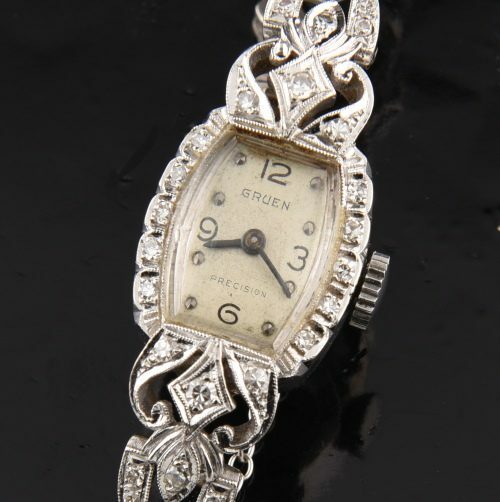 This all solid white gold vintage diamond watch is priced to sell.